Turn heads in the Got To Get Away Top! 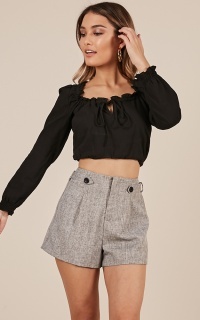 This crop top is fully lined with a center front tie up closure for easy wear. This casual occasion piece also features a cropped length and a plunging neckline. Prepare to look amazing in this top. I absolutely love this top! Can dress this top up for a more business look or dress it down for a more casual look. In love with the material, super comfortable.